Offering some sort of extensibility can improve the overall usability of a software program. The prime example for this is the Firefox web browser which would only be half as good without its extensions. The Windows Live team had similar thoughts as they launched a new website for Windows Live plug-ins. Plug-ins are small extensions of Windows Live programs that add a new feature to one of the Windows Live applications. 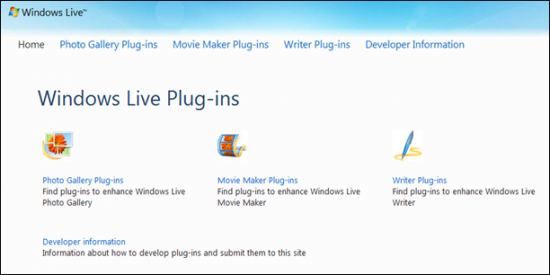 The Windows Live Plug-ins website is currently listing plug-ins for Photo Gallery, Movie Maker and Writer. The interesting part is that Microsoft welcomes developers to develop and submit plug-ins for Windows Live which could be offered on the official site eventually, if they pass some form of quality assessment. Windows Live Photo Gallery: Plug-ins to publish photos (and videos) on image (video) hosting sites including Facebook, Youtube and Smug Mug. Windows Live Movie Maker: Only three plug-ins to upload to Youtube, Facebook or Smug Mug. Windows Live Writer: Many plug-ins for post publishing, formatting, content insertion or photos and videos. Windows Live Writer users are most likely to find plug-ins that will improve their workflow. It remains to be seen if Microsoft can entice developers to code plug-ins for Windows Live. Lets hope it does not end up similar to developing browser plug-ins for Microsoft's Internet Explorer (which is more or less non-existent).